HOLLYWOOD, Calif., Oct. 16, 2018 /PRNewswire/ -- Fender Musical Instruments Corporation (FMIC) today released new research led in conjunction with Egg Strategy™, detailing the vibrant, current state of guitar playing in the United States and United Kingdom. 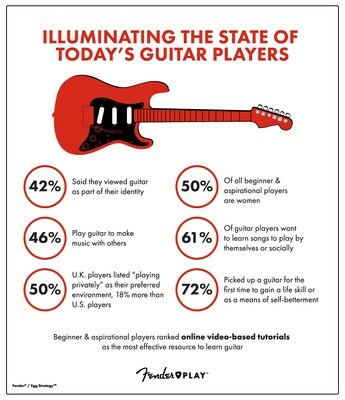 As part of the brand's ongoing commitment to players at every stage of their musical journey, the research was commissioned to better understand the current generation of guitar players, their needs, desires and overall lifestyle preferences. The findings revealed that, much like the instrument itself, the archetype of the "guitar god" in music and culture has evolved. Musicians are playing guitar now more than ever*, but in new, innovative ways in today's diverse, popular music landscape. With the rise of streaming and sharing platforms, artists around the world have even more access and empowerment to create and share music. In tandem, Fender consulted with award-winning neuroscientist, musician, record producer and author Daniel Levitin, who is best known for his New York Times best-selling book This is Your Brain on Music, to dig into the physical, mental and emotional benefits of playing an instrument. 72 percent of respondents cited they picked up guitar for the first time to gain a life skill or as a means of self-betterment. Players in the U.S. and U.K. cited differences in where they play, with 50 percent of respondents in the U.K. listing "playing privately" as their preferred environment, 18 percent more than U.S. players. Respondents had humble aspirations and were not looking for rockstar status with 61 percent of guitar players simply wanting to learn songs to play by themselves or socially. In most cases, new players are looking to play favorite songs for their friends and family, with 46 percent wanting to make music with others. 42 percent said they viewed guitar as part of their identity. Beginning and aspirational guitar players ranked online, video-based tutorials as the "most-effective resource to learn guitar," even over private lessons. Diversity: The research found that the guitar players of today are more diverse than ever before. Women continue to define the emerging guitar market, accounting for 50 percent of all beginner and aspirational players. The growing diversity of players expands beyond gender, as well. Both African-American and Hispanic consumers now represent a significant and growing share of new players: African-Americans account for 19 percent of aspirational players, while Latin players make up 25 percent of beginners. "Today's players have grown up in a different cultural context and popular music landscape, and rising artists like Mura Masa, Tash Sultana, Youngr, Daniel Caesar, Grimes and Ed Sheeran are changing the way guitar is being used," said Andy Mooney, Fender CEO. "As a brand, we are committed to creating tools – both physical and digital – that this generation of creators needs for self-expression, now and in the future." Motivation: The evolution of the players themselves leads to the question, "Why are people today picking up the guitar in the first place?" Fender's research found that currently, new players' motivations are intrinsic, with 72 percent of respondents citing they picked up guitar for the first time to gain a life skill or as a means of self-betterment. To dig deeper into the insight, Fender consulted Daniel Levitin who shared, "Playing an instrument can certainly improve a person's overall well-being. Playing even five minutes a day can lead to a range of physical, mental and emotional benefits." Health and wellness benefits: Research participants confirmed that they experienced obvious emotional benefits, such as increased creativity and self-expression, but also cited less obvious benefits like increased patience, confidence in self and skills, work ethic and persistence over time. Beyond the emotional component, playing an instrument also has proven physical benefits, including enhanced hand-eye coordination, a boost to the immune system and enhanced brain development, especially in youth and older players. Learning an instrument can even help stave off Alzheimer's disease, Levitin said. "After 60, playing an instrument can help you retrain and remap neural circuits that are inclined to atrophy, which helps you stay mentally young," he added. "Learning an instrument can also help develop your brain when you are a kid." Mental benefits were another potential result of playing an instrument. "Playing an instrument has a meditative aspect that can release positive hormones in the brain and can reduce the stress hormone Cortisol, increase productivity, and create social bonding to combat loneliness in the digital age," adds Levitin. "Playing music with other people produces the chemical oxytocin, a binding chemical that promotes trust and social bonding and makes you feel better." According to Levitin, other mental benefits associated with playing music with others include increased feelings of compassion, bonding, empathy and generosity toward others, as well as heightened self-efficacy. "Playing a musical instrument is a valued skill," he added. "When we play an instrument, it allows us to see ourselves differently – taking on something that is seen as being a masterful skill in society. The mental benefits of playing an instrument extend to all types or players – from beginners to artists. "One thing I always emphasize now, is the importance of taking care of yourself and your mental health," said Joe Barksdale, NFL athlete and long-time Fender artist. "It took me a long time to get to a point where I put my mental health above other things, and I can honestly say that it has helped me grow leaps and bounds as an individual and performance-wise." Global insights and playing environment: Players in the U.S. and U.K. cited differences in where they play with 50 percent of respondents in the U.K. listing "playing privately" as their preferred environment, 18 percent more so than U.S. players. "Letting your mind wander is the key to reducing anxiety," Levitin said. "We get our minds to wander by walking in nature or playing music – that's what hits the reset button on the brain. Even just 15 minutes of 'wandering' and playing an instrument can increase productivity." The type of music most played also differed between the two countries with Rock, Classic Rock, Hip-Hop, and Country more prevalent in the U.S. and Blues, Indie Rock and Reggae favored among U.K. players. The lifestyle of players in both regions is also contrasting, with U.K. players inhabiting more urban areas than their U.S. counterparts, who tend to live in more suburban settings; however, both have humble aspirations and are not looking for rockstar status, with 61 percent of players simply wanting to learn songs to play by themselves or socially. In most cases, new players were looking to play their favorite songs for their friends and family. Challenges and barriers: The research did reveal challenges around learning to play guitar, with lack of free time and the long process of acquiring skills cited as the primary barriers. "Like many things in the digital age, new guitar players want quick results and learning an instrument is not an overnight task," said Matt Lake, Fender Play Instructor. "To quickly and reliably learn, players need tools for learning they can use in their own environment, and at their convenience." Nearly half of beginners stated they quit learning an instrument due to time constraints, and 33 percent of beginners shared they were not growing skills fast enough or as fast as they thought they would. The reality is that it's much easier for a person to binge-watch a Netflix series in their free time than learn guitar, but the rise of digital technology also has an upside, especially for specific types of learners. Levitin shared that when it comes to learning, there are different kind of students. For example, autodidacts thrive in an online learning environment, because they are good at teaching themselves – as opposed to conventional learners, who are schooled and formally trained, he said. Levitin also added that the best way to learn is through "playing your favorite songs" for 5 minutes a day every day at the same time of day, rather than two hours one day. "Fender Play is special to me because not only does it provide me with the tools to pick up the guitar at my own pace, but the Fender Play Facebook community has really provided me with the support I need to stick with it," said Fender Play student Keith Means. Learning Guitar in the Digital Era: Ultimately, in this digital age, people find themselves with less time than ever before. In addition, worldwide technology has changed the way the general population functions, and as a result, the way creators are learning and using guitar has evolved. Digital tools like Fender Play – the complete learning subscription app for guitar, bass and ukulele – have created an increased level of access to aspiring and beginning players. While there are thousands of instructional videos on the internet, Fender Play is in a class of its own, allowing players to choose the instrument, songs and genres they want to learn, while tracking their progress in real time. In addition, the program addresses time concerns by helping players learn at their own pace and automatically bookmark where they left off in the clear, unified curriculum. "In 2015, we found more than 90 percent of first-time players abandoned guitar in 12 months – if not the first 90 days – but the 10 percent that didn't, tended to commit to the instrument for life and own multiple guitars and amps," Mooney said. "It's our central mission at Fender to accompany players at every stage of their musical journey – and more importantly keep new players playing." While, the majority of today's players may not be looking to become the next rock star, the health and social benefits of music are long established. Whether digital learning apps like Fender Play could help inspire the next guitar hero of our generation—or simply help improve daily quality of life—one thing is for sure; the way we learn and play musical instruments will continue to evolve, and the benefits, access and convenience of digital tools open up a rich learning environment for today's players and generations to come. New players can sign up for a free trial at play.fender.com, and can cancel anytime or continue their journey for $9.99 (USD) per month. As part of the brand's commitment, Fender believes learning is a life-long pursuit and is devoted to helping players start and progress in their musical journey. That's why Fender is introducing a special discount for all annual Fender Play subscribers. Beginning today, users can sign up for a 12-month Fender Play subscription for $89.99 per year ($7.50 a month) and get 10 percent off guitars, amps and gear on Fender.com and at participating retailers. High-resolution lifestyle and program images of Fender Play can be accessed here. 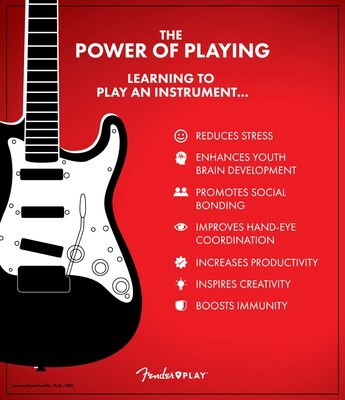 Infographics on the benefits of learning an instrument and key research findings are here. To learn more about Fender Play, visit play.fender.com. Fender Play is also available on-the-go with the Fender Play app for iPhone, Android and iPad. For additional information on new Fender products and to find a retail partner near you, visit www.fender.com. Join the conversation on social media by following @Fender. In Spring/Summer 2018, Fender commissioned a quantitative and qualitative research project with Denver-based Egg Strategy that gathered responses from 500 aspiring and beginning players from the U.S. and U.K, with a representative mix of gender, ethnicity and age. Since 1946, Fender has revolutionized music and culture as one of the world's leading musical instrument manufacturers, marketers and distributors. Fender Musical Instruments Corporation (FMIC), whose portfolio of brands includes Fender®, Squier®, Gretsch® guitars, Jackson®, EVH® and Charvel®, follows a player-centric approach to crafting the highest quality instruments and musical solutions across genres. FMIC is dedicated to unlocking the power of music through electric and acoustic guitars, amplifiers, pro audio, accessories and digital products that inspire and enable musical expression at every stage, from beginners to history-making legends. Established in 2015, Fender Digital is a wholly owned division of Fender Musical Instruments Corporation (FMIC) dedicated to connecting a legacy brand with a new digital ecosystem of products and interactive experiences designed to accompany players, across genres, at every stage of their musical journey. Building on the iconic Fender name, Fender Digital designs and develops apps, websites, platforms and tools to complement Fender electric and acoustic guitars, amplifiers and pro-audio gear to inspire players through a 360-degree musical experience. Since its inception, Fender Digital has introduced Fender Tune™ and Fender Tone™ for iOS and Android; Fender Play™ for iPhone®, iPad®, Android™ and Desktop; relaunched Fender.com with a refreshed product experience; and created Fender Connect™ offering a platform for users to store their personalized information from Fender Digital platforms in one place, providing a universally connected experience. Daniel Levitin is an award-winning scientist, musician, author and record producer. He is the author of three consecutive No. 1 best-selling books: This Is Your Brain on Music, The World in Six Songs and The Organized Mind. He is Founding Dean of Arts & Humanities at the Minerva Schools at KGI in San Francisco. He is also a Distinguished Faculty Fellow at the Haas School of Business at UC Berkeley, and James McGill Professor Emeritus of Neuroscience and Music at McGill University. Egg Strategy is an insight, brand strategy and innovation consultancy that delivers simple, bold truths. Its core strength is rooted in simplicity. Exploring the messiness of modern life, Egg Strategy creates bold solutions that are profoundly simple to embrace, because they're rooted in fundamental human truths. Within Egg Consumer Products, Egg Health, and Egg Lifestyle divisions, the company works with world-class clients across the globe, supported by cutting-edge insight mining tools, qualitative and quantitative research. Proudly, Egg Strategy brings these core values to bear on each and every client partnership: courageous thinking, creativity with purpose, genuine collaboration and infectious leadership.